Some books feel like enclosed spaces; they make you linger, stare out a window, reminisce towards the edges of the world they create without ever really needing to step over the line. There is a certain amount of comfort in that containment, in not needing anything else, in introspection. Other books feel wide open, pushing you out, forcing you down a rabbit hole of supplemental reads. Rather than ending at the last page, these stories do not stop until you let them, until you’re done researching and clicking and digging deeper into places that stretch way beyond the text itself. Those books serve as starting points, launch pads for deep dives into unknown territories outlined with keywords and searches. The pages move quickly, not only because you want to see where it goes next, but also because you want to see where you go next, now that you’ve been reminded of a million other things that you want to read and reread. While this sort hypertext may not be as new of a phenomenon as us internet-age critics would like to believe, what has changed is our ability to pursue these lines of inquiry at lightning speed, to immediately expand the book’s reach to fit our personal curiosities and intellectual endeavors. Germán Sierra’s The Artifact firmly belongs in the second group, so much so that the author includes Google and Wikipedia in his list of references. In my internet-searching fervor after putting down Sierra’s book, I eventually found myself scrolling through Langdon Winner’s 1980 essay “Do Artifacts Have Politics?,” in which the social scientist asks whether or not certain technologies could have inherent connections to power and authority outside their manipulations by human users. Winner argues that while some technologies merely facilitate subjugation or liberation, others, like the atomic bomb, are unavoidably devastating and authoritarian. Winner writes, “The things we call ‘technologies’ are ways of building order in our world…The issues that divide or unite people in society are settled not only in the institutions and practices of politics proper, but also, and less obviously, in tangible arrangements of steel and concrete, wires and transistors, nuts and bolts.” Winner’s understanding of technology as a way to order the world reminded me of Sylvia Wynter’s more recent statements on the similar function of humanness. Wynter, speaking with Katherine McKittrick in a conversation entitled “Unparalleled Catastrophe for our Species? Or, to Give Humanness a Different Future,” argues that our current understanding of being human “provides our present order of knowledge—an order of knowledge that is indispensable to the continued reproduction of our present neoliberal/neo-imperial, secularly biocentric, global order of words and things.” Wynter explains that our current problems, including the gravest issue of global warming, cannot be resolved since all the solutions remain based in the model of humanness and an order of knowledge within which the situation was created in the first place. Understanding being human as a praxis, rather than as a biological predetermination, Wynter goes on to ask, “What are the mechanisms, what are the technologies, what are the strategies by which we prescribe our own roles?” The struggle for liberation and self-determination thus appears to be based in the articulation of inclusive models of humanness and the democratized deployment of technology. 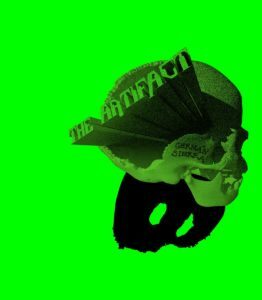 This relationship between technology and humanness leads us back to Sierra’s The Artifact, the Spanish author’s first book written in English, and a frenetic story of a man questioning the bodies and technologies around him. After a tragic yet ultra-contemporary accident involving a drone crashing into his windshield, a neuroscientist is fitted with a high-tech prosthetic arm that he refers to as his antenna: “a futuristic meta, ceramic and plastic arthropodal limb attached to my humerus where bones and flesh used to be sucking blood. It perceives the environment in its very own meta-robotic way and then its sensations are supposed to be translated into a fleshy babble my body would be able to understand.” As a single apparatus, the antenna both sustains and destroys him: “Sometimes I think of my antenna as a venomous stinger stuck in my arm slowly infusing a life-supporting poison, an armored amphisbaena connecting me to strangers with its synchronous double bite.” But, by calling it an antenna, the protagonist/narrator cannot help but see his new appendage as inseparable from the ubiquitous networks and systems that occupy our airwaves and touchscreens. The conjunction between flesh, machine and information that his antenna represents forces him to reconsider personal, mechanical, and digital connections. Though there is something of a plot to be found in The Artifact, the main focus is on the narrator’s over-thinking of these human and non-human interactions. For example, some of his sexual partners fetishize his prosthetic, while others ask him to remove it; both reactions elicit pages of contemplation and digression, theorizing on what it means to inhabit a body that no longer feels like one’s own. …something that just automatically spirals on, words popping on a screen or on a skin or on any wordable surface to pattern themselves like spontaneously self-organizing flying birds or insects into sentences and paragraphs and whatever in any language or languages, roman letters mixing with ideograms, icons, hieroglyphs, abstract blots, infecting each other, shaping each other like perpetually recombinant organisms. The narrator’s thoughts on contemporary writing are impressively mirrored in the actual form of Sierra’s book. At less than 60 pages, it reads more like an online treatise than a novel, and the scenes flash back and forth like a browser window with too many tabs open. That seems to be the point. In a conversation with Shane Jesse Christmass published in Full Stop in August 2018, Sierra credits Twitter for influencing him to write in English, and went on to say that “Writing, for me, means threatening language (in a similar way that science is a threat to reality).” Not only does The Artifact show how hyper-technology threatens to mutate how we read and write, it invites that threat, treats it like a challenge, and shows us the rich potential of such a shake-up. Mori is the detached evil genius sleuthing the missing link between humankind and machines…Money runs through her flesh, circulates her darkly elastic veins like phosphorescent electric blood she keeps absorbing through her delicate fingertips from the computer terminal. She’s a celestial body wanting to be fed code money, a permanently-plugged cash meta-processor, an addict to videogame capitalism—recycling most of the wealth she manages to transfer to her several bank accounts into further financial gambling; using it, like gaudy game tokens, to go on playing, to unlock a new level of swift desire and achieve, once again, a sparkle of recognition in the form of newly acquired transparent jellyfish luminescence. Implicating both the user and the system within which they live and play, the narrator projects his own alienation from his human body onto the those around him. Hyper-technology and “videogame capitalism” have affected his sense of order, of how connections are made, of how success is measured. Everyday life and survival is now a virtual reality game in which achievements are unlocked and missions are fulfilled. Despite their physical forms, his body and those around him are nothing more than avatars participating in a simulation, defined by the technologies on which they depend. Sierra, a neuroscientist, incorporates his scientific knowledge into his work. In the previously mentioned Full Stop conversation, he says, “There are two kinds of scientists: the sceptics (those who focus on being aware of what we don’t know) and the pragmatists. I’m much closer to the first type. When writing fiction, I’m more interested on how science affects our socio-cultural environment than on ‘scientifically explaining’ things.” The influence of this background shines brightly in the text with the discovery of the artifact, a technological glitch found in the brain scan of a serial experiment participant known only as the Control Subject. The narrator aids an associate named Addia in her search for the man who they believe carries around a fold in reality within his skull. Had it been written in a different time or by a different author, the quest for the artifact would have become the center of the text. Instead, it is not framed as a pursuit for a great scientific discovery, but for more useless data that will continue to prove the relative insignificance of our actions. On Addia’s infatuation with the glitch, the narrator explains, “she’s not considering the artifact as a significant event but committed to its amazingly stubborn lack of signification, to its spitting uniqueness, to the threat it poses to her precise and active method of curiosity if not dismissed.” That, according to the narrator, is the very un-Terminator way in which technology may bring about our ultimate demise: “A machine not becoming intelligent, conscious, evil, god-like, or anything like we think we might want or fear it to be, but just strolling the landscape of atoms and energies the way any longstanding cluster of matter ever in the Universe might have went through.” As Wynter would say, our current “unparalleled catastrophe” is not just about the larger, most visible issues, but the organizing structure of humanness that feeds both the original problems and their failed solutions. As technology continues to reshape our relationships to the world and others, the fight to protect the human species must begin with a social and historical understanding of what it means to be human. Samuel Ginsburg is a Lecturer of Spanish at the University of Texas at Austin, where he earned a PhD in 2018. He studies representations of bodies and technology in Cuban, Dominican, and Puerto Rican science fiction.